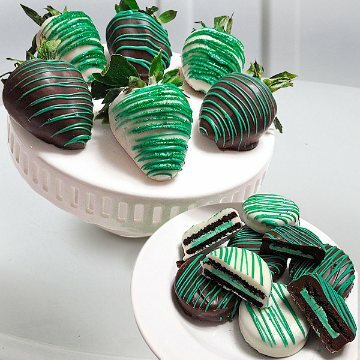 Each plump, vine-ripened strawberry is specially selected for its size, sweetness and juiciness and is topped with a healthy head of natural green strawberry leaves, while Oreo® Cookies have been a time honored favorite. Each strawberry and cookie is then hand-dipped in velvety 100% Real chocolate with zig-zagging ropes of drizzled mint chocolate. With every bite, these gourmet goodies will be the life of the party, celebration, or special occasion! This gift includes the following: 6 Sweet, succulent, fresh strawberries and 6 dipped Oreo® cookies.